CSS được xem là ngôn ngữ tạo nên bố cục và kiểu dáng cho website, nó được sử dụng rộng rải trên toàn thế giới. Tuy nhiên để có thể nắm rõ và sử dụng được hết các thuộc tính của nó thì không hề dễ dàng gì. Hôm nay, mình xin được giới thiệu với các bạn những công cụ hữu ích giúp bạn tạo những đoạn mã CSS hoàn toàn miễn phí. 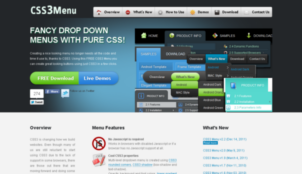 CSS3 Please is another very helpful site which allow you to copy and paste most common CSS3 declarations. It also has a preview area so you can live test your declarations. Are you surprised that Internet Explorer 6/8 CSS3 support is almost non existent? I guess most of you aren’t. Unfortunately, some clients may want you to create a website that look like in a modern browser in IE. 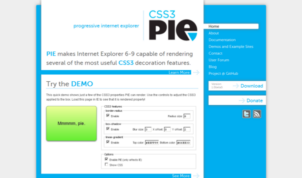 This is when CSS3 Pie is useful: It allows you to use most of the CSS3 cool features on IE. 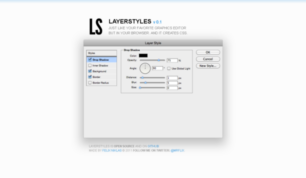 With this tool, you can design complex CSS3 boxes using an interface looking exactly like the one used for applying Photoshop effects. Definitely a great tool to save lots of time. 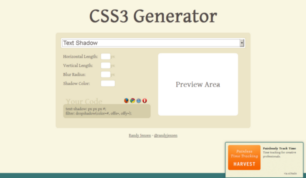 This one is quite similar to CSS3 builder, just use the sliders to visually design your drop shadow. Once done, just copy the CSS code which have been automatically created. Paste it to your css file, and you’re ready to go! Border Radius makes your designs look more elegant with less effort. Enter the desired value, and it will generate code for rectangles with different border specifications. Use it to make your designs adorable. 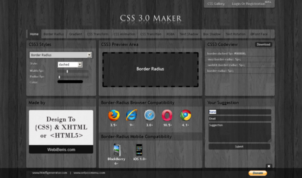 CSS3 Maker is a thrifty tool that comes with a drop-down menu and various other options, including box sizing, outline selectors and transformers. Just enter the desired values in the boxes and the code is generated, along with a preview. The code is available for download. 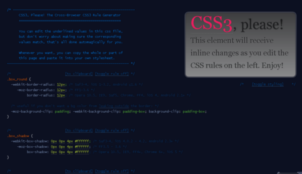 This tool isn’t CSS3 specific, but it is so useful that it would have been a shame not to include it on that list. Cascader lets you input some HTML code and it will detect all inline CSS, remove it from the HTML and add it to a separate stylesheet. A true time saver for those looking for clean HTML. 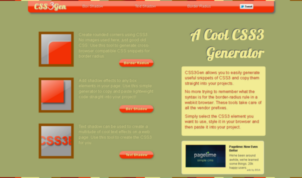 CSS3 Gen is a handy tool for novice developers. Use the controls to make a progressive layout: create rounded corners, add shadow effects to any box element, and play with cool text effects. 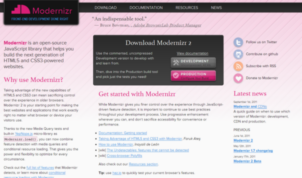 The tool also helps developers by specifying the code’s compatibility with browsers. Need to know if Internet Explorer 8 supports the text-shadow property? 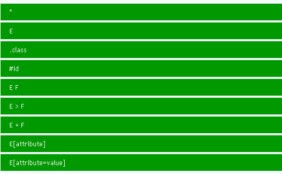 Just have a look to this very useful chart, which reveals CSS3 support for all major browsers. Definitely a page to have in your bookmarks! When coding, cheat sheets are very helpful to quickly remember properties and their syntax. 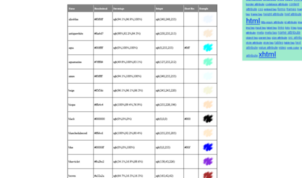 Smashing Magazine has created this CSS3 cheat sheet that you can download and print. 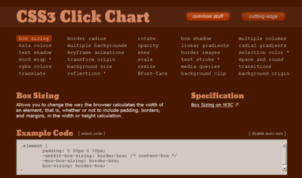 CSS3 Click Chart assists with great effects such as RGBa colors, box shadows, radial gradients and rotation. Developers can adjust background sizes and give text amazing stroke effects. However, the tool does not have many flexible options for customizing code. Still, it’s an effective auto-generator that can save time. 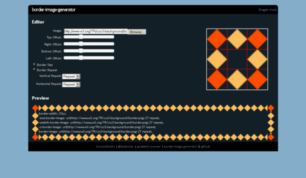 Border-image-generator is an exciting CSS3 tool that you can use to generate cool border images by adjusting sliders. Get instant code for the border-radius property. Select any image and use it to style the background and border of a specified element, and give your design a stunning look. Westciv is a must-bookmark collection of tools. Use XRAY to see the position, margins, padding and many more details of any element. MRI helps you generate the best possible selectors for a particular element. 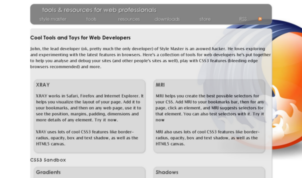 CSS3 Sandbox includes gradients, shadows and CSS transforms. And still others are said to be coming soon. 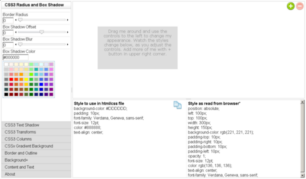 Xeo CSS is an interactive tool with a desktop-like experience. 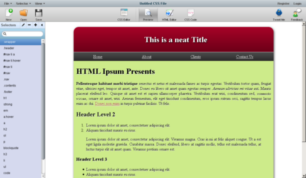 It helps developers and beginners design CSS and HTML pages without writing a single line of code. 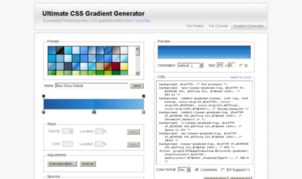 It generates not only CSS3 snippets but classes and ID selectors. Overall, it’s a great tool. Register and start designing an extraordinary Web layout. CSS Corners enables you to create rounded corners with gradients to give your design a professional look. 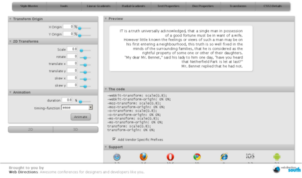 The rounded corners code is supported by many browsers. All you need to do is use the controls, along with the little preview feature, and get the code. Buttons can make a design look elegant—but if they’re not designed well, they could destroy the entire layout. Create cool buttons by adding gradients and shadows. 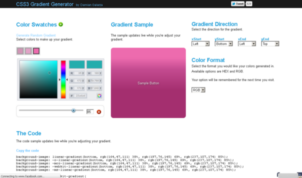 CSS3 Gradient Button Generator generates the relevant code in a few seconds, offering a variety of controls, including gradient, text and hover effects. Spritebox is a WYSIWYG tool (“what you see is what you get”), helping developers create CSS classes and IDs from a single sprite image. The drag-and-drop option makes this tool pleasantly interactive. 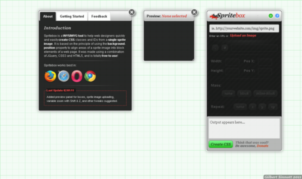 Spritebox supports many browsers, so compatibility issues can be quickly resolved. Select any part of an image, which can be fetched from any URL or uploaded from a computer, and define the class name. 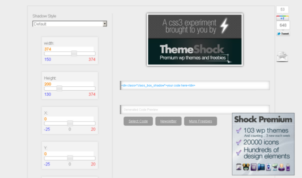 The tool will automatically create CSS rules for the background position. Give your design a colorful yet composed look with the Adobe-like features in Gradient Editor. Design transparent CSS gradients and add fade-in, fade-out, semi-transparency and similar effects to get a colorful gradient button.